You have added Zipped Up Mixed Lace Dress in Black into shopping cart. FINAL SALE. This A-line black lace dress is a chic party dress that can be worn year-round. The Zipped Up Mixed Lace Dress is made of various panels of black lace lined in beige fabric for contrast. It has a V neckline, wide shoulder straps, a banded empire waist, and a flowy cut. An exposed zipper down the front of this dress adds an edginess to this look. The open back design completes this dress. 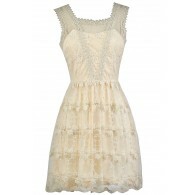 The Zipped Up Mixed Lace Dress is a cute option to wear to nearly any party or get-together. Pair it with black or beige pumps or heels for a chic look. Details: Fully lined. Exposed front zipper. 75% polyamide, 25% polyester. Contrast 1: 88% polyamide, 12% spandex. Contrast 2: 100% polyamide. Contrast 3: 97% polyamide, 3% spandex. Lining: 100% polyester. Dry clean only. Small measurements: Length from top of shoulder to hemline: 34". Bust: 33". You have added Zipped Up Mixed Lace Dress in Black into Wishlist. You have added Zipped Up Mixed Lace Dress in Black for Stock Notification. 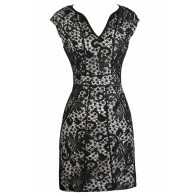 You have set Zipped Up Mixed Lace Dress in Black as a loved product. You have removed Zipped Up Mixed Lace Dress in Black as a loved product.